April 20, 2016 at Samantha’s Bistro & Grill, Ikoyi, Lagos, the organizers of Africa Fashion Week Nigeria & Africa Fashion Week London, officially announced Nigerian songstress, Yemi Alade as its official Brand Ambassador. Our distinct journey as a proudly Nigerian, proudly African and an international brand began about 6 years ago in London. What we started then as a small brand to satisfy a niche, has now gone on to become an award winning and very well recognized brand which is the biggest platform of its kind in Europe showcasing African designers and African-inspired fashion. The popularity and success of the Africa Fashion Week London brand was what triggered us to bring the brand home to Nigeria. Africa Fashion Week Nigeria, now in its 3rd year has been a memorable and very fulfilling journey. In just a few months, we will not only be celebrating our 3rd anniversary but it will yet be another Africa Fashion Week from 1st July – 3rd July 2016 with a fashion exhibition and showcase of upcoming and established designers. From the word go, our mantra was to discover young new exciting brands by providing a platform to build and promote them to an international standard. Africa Fashion Week Nigeria promotes the beauty of Africa, from the creative side of fashion to the business of it. Ronke Ademiluyi founder of AFWN said ‘This year, we chose someone who embodies the true African woman. A strong, intellectual and musically inclined woman; her music reflects what’s good, what’s great and what’s best about the motherland. We couldn’t have chosen anyone more suitable to be our brand ambassador’. Known to the world as Mama Africa, but known to us as Yemi Alade. 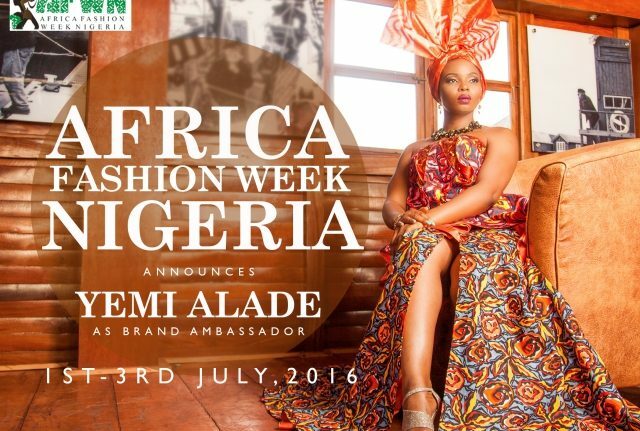 Yemi Alade who is also a jewellery designer, launched her first collection of costume jewellery ‘Yemi Alade Collection’ with online jewellery retailer, Bland2Glam in 2015, spoke about her excitement as the 2016 AFWN & AFWL brand ambassador, also shared with the press her upcoming fashion project working with some of the emerging designers which would be launched come July at AFWN2016. The ‘Johnny’ crooner is a great addition to the Africa Fashion Week brand seeing as she’ll bring a lot of energy and drama to the upcoming AFWN from 1st July – 3rd July 2016 and AFWL 16th September – 17th September 2016 at the prestigious Eko Hotel & Suites and London Olympia, West Kensington respectively.